Taking smartphone experience to an all new level, home grown manufacturer, Micromax has created ‘nothing like anything’ yet again with Canvas MAd, and it is now available in India. Micromax will now pay you to watch your favorite advertisements through ‘MAd’, a unique application, which will come pre-loaded on its latest smartphone Micromax MAd A94. 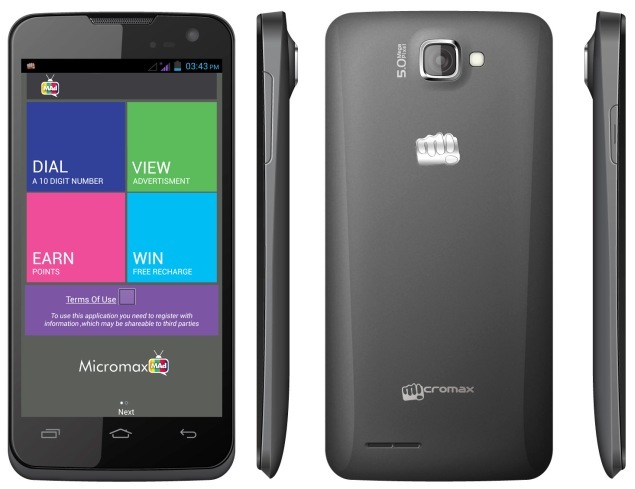 Micromax Canvas MAd has been priced at Rs 8,490 and is now available for sale. Through MAd, consumers can view advertisements and get rewarded for the same. There reward points can be used to pay postpaid mobile bills or get prepaid balance credits. consumers can view advertisements and get rewarded for it. There rewards points can be used to pay postpaid mobile bills or get prepaid balance credits. With one time registration, the service will work for all opted-in subscribers across all telecom operators. Talking about the specifications, Micromax Canvas MAd sports a 11.43-cm (4.5-inch) FWVGA display, 1.2GHz quad-core processor and 512MB of RAM. It features 5MP auto focus rear and front cameras and 1800mAh battery. The phone also comes with 4GB of internal storage. The phone comes with Android Jelly Bean 4.2.2 out-of-the-box. Micromax MAd aims to create a powerful medium to interact, engage, entertain and connect with the consumers and would provide a high engagement communication channel for the brands to break away from the clutter, according to Micromax co-founder Rahul Sharma.